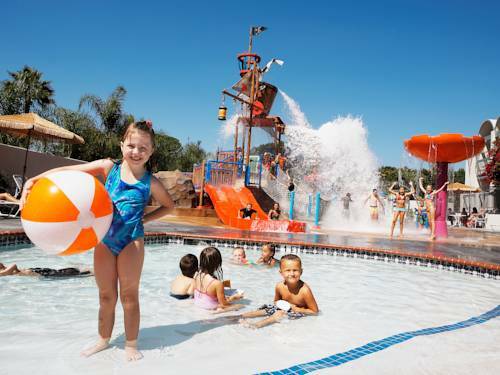 Spend your next family vacation at this Howard Johnson Anaheim Hotel and Water Playground. Walk to a day with your favorite characters and rides at Disneyland across the street, or to the Anaheim Garden Walk or Downtown Disney for shopping and entertainment. Book a tour of Universal Studios Hollywood or Sea World San Diego minutes away. Enjoy French and American food at Mimis Cafe across the street from this smoke-free lodging. Take the family to the on-site water playground, Castaway Cove, with slides, water cannons and a pirate ship. Toddlers can also join in the fun at the onsite Speedys Sprayground with splash fountains and a kiddie pool. Enjoy complimentary wireless Internet access, complimentary parking and game room. Take advantage of the shuttle service to and from Disneyland for a small charge. Stay productive in the lobby with printing services. Guest rooms include coffee-maker, refrigerator and lush bedding, or book a suite with microwave, balcony and views of Disneyland.